Concentration Camps - Nazi Germany World War 2 Section. Nazi concentration camps were maintained in Nazi Germany prior to and during World War II. Nazi concentration camps were termed (Konzentrationslager, abbreviated KZ or KL) throughout the territories it controlled. In these Nazi concentration camps, millions of prisoners were killed through mistreatment, disease, starvation, and overwork, or were executed as unfit for labor. The Nazis adopted the term euphemistically from the British concentration camps of the Second Anglo-Boer War to conceal the deadly nature of the camps. The first Nazi concentration camps were set up inside Germany and were intended to hold political opponents of the regime. Piles of bodies in a liberated Nazi concentration camp in Germany. The two principal groups of prisoners in the Nazi concentration camps, both numbering in the millions, were Jews and Soviet prisoners of war (POWs). Large numbers of Roma (or Gypsies), Poles, political prisoners, homosexuals, and others-including common criminals-were also sent to the camps. In addition, a small number of Western Allied POWs were sent to concentration camps for various reasons. Western Allied POWs who were Jews, or whom the Nazis believed to be Jewish, were usually sent to ordinary POW camps; however, a small number were sent to concentration camps under anti-semitic policies. Starting in 1942, Nazi Germany established extermination or death camps for the sole purpose of carrying out the industrialized murder of the Jews of Europe-the Final Solution. These camps were established in occupied Poland and Belarus, on the territory of the General Government. Over three million Jews would die in them, primarily by poison gas, usually in gas chambers, although many prisoners were killed in mass shootings and by other means. 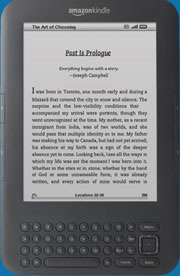 These death camps, including Belzec, Sobibor, Treblinka, and Auschwitz-Birkenau, are commonly but erroneously referred to as concentration camps, but Holocaust scholars draw a distinction between concentration camps (described in this article) and these extermination camps (described in a separate article). Nazi concentration camps before the war. The Nazis were the only political party in Germany with paramilitary organizations at its disposal, the Schutzstaffel (SS) and the Sturmabteilung (SA), both of which perpetrated surprise attacks on the offices and members of other parties throughout the 1920s. After the 1932 elections it became clear to the Nazi leadership that they would never be able to secure a majority of votes and that they would have to rely on other means to gain power. While gradually intensifying their acts of violence to wreak havoc among the opposition in the run-up to the 1933 elections, the Nazis set up concentration centers in Germany, many of which were established by local authorities, to hold, torture, or kill political prisoners and "undesirables" such as outspoken journalists and Communists. These early prisons-usually basements and storehouses-were eventually consolidated into full-blown, centrally run camps outside the cities and somewhat removed from the public eye. By 1939, six large concentration camps had been established: Dachau (1933), Sachsenhausen (1936), Buchenwald (1937), Flossenbürg (1938), Mauthausen (1938), and Ravensbrück (1939). Major German concentration camps, 1944. After 1939, with the beginning of the Second World War, concentration camps increasingly became places where the enemies of the Nazis were killed, enslaved, starved, and tortured. During the War concentration camps for "undesirables" spread throughout Europe. New camps were created near centers of dense "undesirable" populations, often focusing on areas with large communities of Jewish, Polish intelligentsia, Communists, or Roma. Most camps were located in the area of General Government in occupied Poland for a simple logistical reason: millions of Jews lived in Poland. It also allowed the Nazis to transport the German Jews outside of the German main territory. In most camps, prisoners were forced to wear identifying overalls with colored badges according to their categorization: red triangles for Communists and other political prisoners, green triangles for common criminals, pink for homosexual men, purple for Jehovah’s Witnesses, black for Gypsies and asocials, and yellow for Jews. 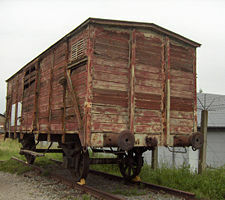 Original boxcar used for transport to the concentration camps on display at Fort van Breendonk, Belgium. Prisoners were often transported under horrifying conditions using rail freight cars, in which many died before they reached their destination. The prisoners were confined the rail cars, often for days or weeks, without food or water. Many died of dehydration in the intense heat of summer or froze to death in winter. Concentration camps for Jews and other "undesirables" also existed in Germany itself, and while they were not specifically designed for systematic extermination, many of their prisoners died because of harsh conditions or were executed. Sometimes the concentration camps were used to hold important prisoners, such as the generals involved in the attempted assassination of Hitler; U-Boat Captain-turned-Lutheran pastor Martin Niemöller; and Admiral Wilhelm Canaris, who was interned at Flossenbürg in February 7, 1945, until he was hanged on April 9, shortly before the war’s end. 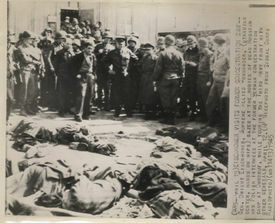 General (later US President) Dwight Eisenhower inspecting prisoners’ corpses at a liberated concentration camp, 1945. In the early spring of 1941 the SS, along with doctors and officials of the T-4 Euthanasia Program, began killing selected concentration camp prisoners in "Operation 14f13". The Inspectorate of the Concentration Camps categorized all files dealing with the death of prisoners as 14f, and those of prisoners sent to the T-4 gas chambers as 14f13. Under the language regulations of the SS, selected prisoners were designated for "special treatment (German: Sonderbehandlung) 14f3". Prisoners were officially selected based on their medical condition; namely, those permanently unfit for labor due to illness. Unofficially, racial and eugenic criteria were used: Jews, the handicapped, and those with criminal or antisocial records were selected. For Jewish prisoners there was not even the pretense of a medical examination: the arrest record was listed as a physician’s "diagnosis". In early 1943, as the need for labor increased and the gas chambers at Auschwitz became operational, Heinrich Himmler ordered the end of Operation 14f13. After 1942, many small subcamps were set up near factories to provide forced labor. IG Farben established a synthetic rubber plant in 1942 at Auschwitz III (Monowitz), and other camps were set up next to airplane factories, coal mines, and rocket fuel plants. Conditions were brutal, and prisoners were often sent to the gas chambers or killed if they did not work fast enough. After much consideration, the final fate of the Jewish prisoners ("Final Solution") was announced in 1942 at the Wannsee Conference to high ranking officials. The camps were liberated by the Allies between 1943 and 1945, often too late to save the prisoners remaining. For example, when the UK entered Bergen-Belsen concentration camp in 1945, 60,000 prisoners were found alive, but 10,000 died within a week of liberation due to typhus and malnutrition. The British intelligence service had information about the concentration camps, and in 1942 Jan Karski delivered a thorough eyewitness account to the government. Although the actions of the Nazis were publicly condemned after Karski’s visit, no attempts were made to compromise their ability to function. Nazi concentration camps use in the Post-war era. Most Nazi concentration camps were destroyed after the war, though some were made into permanent memorials. In Communist Poland, (Majdanek, Jaworzno, Potulice, Zgoda) and East Germany (Buchenwald, Sachsenhausen), German POWs, suspected Nazis and collaborators, anti-Communists and other political prisoners, as well as civilian members of German, Ukrainian and other ethnic minorities were held in some of the camps between 1945 and 1956. In West Germany, Dachau was used as a prison for arrested Nazis and after that as cheap working-class housing.